Video Recipe - Eggs, for me, is one of the most fascinating cooking ingredients that exist. They are used both in the savoury and the sweet cuisine, and has been part of our diet always. They are healthy, they taste good and they are cheap. Especially for the creamy stuff eggs are indispensable. Since it is a subject that is dear to my heart, I thought I had better write an article about "eggs in soft mixtures". When using eggs to make some creamy textures, there are two main categories. The creams and the emulsions. They do not really have anything to do with each, apart from the fact than in both cases eggs are used to make it creamy. The physical process taking place is is very different. This article is only about making creams. 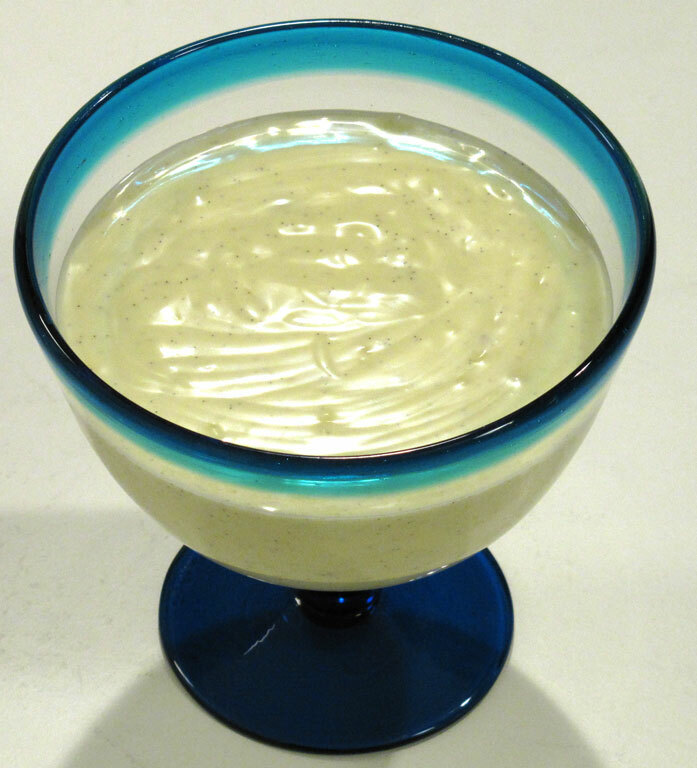 For emulsions you should check out mayonaise and Hollandaise, that are the most well known of these. We probably all know that when you fry or boil an egg, it becomes rigid. It is the same process you use when making plain cream. The difference is that you mix some kind of liquid into the eggs. The liquid may be milk, cream, butter, lemon juice etc. Depending on whether you stir the mixture while you heat it up, you get a stiff or a soft cream. I typically use 3 whole eggs for ½ liter of liquid, but you can also use 9 egg yolks for ½ liter of liquid instead. Or any combination where you replace 1 whole egg with 3 egg yolks. The more yolks, the more golden, soft and creamy the cream will be. 2 eggs and 3 egg yolks with half a liter of liquid is also a good compromise. I use always whole eggs, unless I'm going to use the whites for something else. There should not be too much salt in a cream of milk and eggs. It very easily becomes overly salty. For sweet creams I typically use 150 g (5½ oz) sugar and beans of 1 vanilla pod. You can use less sugar if you prefer. You can also just use the beans from ½ vanilla pod instead. Vanilla is somewhat expensive stuff. I use always a whole pod myself. In British English the word "custard" is used for a cream that is not stirred while it is heated. It is a baked or otherwise heated cream. When no stirring is done, the cream will be gelled/fixed instead of liquid creamy. But in principle it is still a cream. This is a classic danish recipe called "æggestand". This is the most simple form of cream you can make. Milk and eggs are gently warmed in a water bath at a very low simmering temperature. Perhaps with a little salt added. It is an underrated accompaniment to food. If you do not heat the cream in a water bath or heating it at high temperature, then a lot of bubbles are formed in the cream that destroys the fragile texture. You can think of it as if the cream begins to boil. Boiling causes bubbles that consists of steam, which is so hot that it gets the cream on the outside of the bubbles to stiffen. In this way bubbles and holes are formed in the cream, and you can not get rid of them again. The easiest way to do it right, is to put the cream mixture into a freezing bag and then in a saucepan with lightly simmering water. Otherwise use a baking pan and put it into a water bath in the oven. Very well known desserts respectively from france and spain. They are made the same way. First, add the cream to the eggs and sugar, then bake them in a water bath in the oven. When the cream has cooled down then sprinkle sugar on top and burn it to a crispy caramel with a gas burner or the like. It results in a crisp and crunchy caramel on top, with a soft cold cream underneath. Pretty much the same recipe as Creme Brulee and Creme Catalan. The only difference is that we melt some sugar in a sauce pan and pour it into the bottom of the form. On top the caramelized sugar you pour on the cream, and bake it all in a water bath. When the cream has cooled down, you can then turn it over onto a plate for serving. This means that the caramel, now partially dissolved, is located as a brown layer at the top and some of it flows down over the gelatinised cream. A pie base filled with meat, vegetables and an egg cream based on milk. This is the principle in many pies that women in particular seems to enjoy ;-) Just use the standard recipe with added salt. The kind of cheese cake that is based on a cream cheese is actually a variation of a baked cream. The cream substituted with cream cheese. Soft creams (the ones we normally think of as creams) are used almost exclusively in the sweet kitchen. And they generally follow the basic recipe at the top of this article. If you use the basic recipe and heat it to 85°C (185°F) while you stir it, then you have a simple soft cream. See the vanilla ice video below for an example. Plain cream can be a bit too sweet. To avoid this you can mix the cream of the basic recipe with ½ liter (2 cups) of whipped cream. Then you will have a somewhat more light cream that is good with some fresh fruit or in a trifle cake. It is a bit like a whipped-vanilla-sugar-cream, but keeps the creamy consistency a lot better, and can also be used the following day. Use the same recipe a for the sweet cream, but use milk instead of cream. You may want to use 2 eggs instead of 3 to make it a little more smooth and thin. Creme Anglais should be pour-able. This cream can also be frozen for a good vanilla ice cream, which then corresponds to an Italian gelato. It is in the "Firense style" because there are eggs in it. Make a the basic cream recipe cream and add 2 dl (1 smallish cup) milk in it. Then it is ready to go into the ice cream machine or the freezer. If the ice is frozen in the ice cream maker, and while it is still soft, you can mix various jams in it and get all the kinds of fruit/berry ice creams that you can imagine. It is my standard vanilla ice recipe and it never fails. The principle jams also works fine with gelato. A classic English spread is the lemon curd. It is an egg cream that use lemon juice instead of cream. It can also be applied on top of and in layer cakes. When a pure egg cream becomes too hot it begins to separate and curdle. The egg substances can no longer hold on to the liquid in the cream, and they become firm. So you end up with a curdled gritty unappetizing mass that nobody wants to eat. This can be avoided by mixing a little starch into the cream. You can use either flour, potato starch and corn starch. Potato starch can not withstand being heated for too long. Regular wheat flour can be a little gritty and it give of a bit flour taste, unless it is simmered for a long time. Corn starch is without a doubt the best starch to use. Corn starch begins to thicken at about the same temperature where the eggs are at risk of curdling. So it is a perfect fit. Corn starch can also tolerate a lot of heating. If you need a thickened cream for baking, it is no problem to use regular flour instead of corn starch. The cake will have the same grittiness as the cream, and the baking will remove any flour taste. Just use the basic recipe but with milk instead of cream. And no sugar, naturally. This is, in fact just the basic recipe with 3 dl (slightly more than ½ cup) of liquid instead of 5 dl (2 cups), and then divided down to a single egg. Gelled creams - "Cream with gelatin"
Vanilla Pudding is actually just a cream gelled with gelatin instead of eggs, which is set to cool after it has been cooked up. Use the sweet version of the basic recipe with these differences: Equal parts cream and milk. Just 50 g (1½ oz) sugar. Only 1 egg. Let 3 leaves of gelatin soak in cold water. Heat the cream to 85°C (185°F). Take it off the heat. Add the gelatin (without water) and the cream. Pour into one or more molds and place it in the refrigerator for at least 4 hours. The pudding as we know it can actually be thickened with cornstarch instead of gelatin. It does provide a somewhat heavier and more gritty dish. Just make a sweet thickened cream and pour it into a mold. Let it cool at least 4 hours. But Panna Cotta and a Vanilla Pudding is very much in family. Use the same recipe as for pudding, but make the cream without any eggs. Only the cream / milk, vanilla, sugar and gelatin and some grated orange zest. Whipped vanilla cream is not a thickened cream but a whipped cream. You use egg yolk and heavy whipping cream that you whip separately and mix together. That will give the whipped cream a creamy texture. It does not hold that creamy texture for long, and should be served immediately. You use only half the amount of eggs and sugar in relation to the basic recipe.